Today, delightfully, was a snow day - a bonus day off, after a three day weekend. 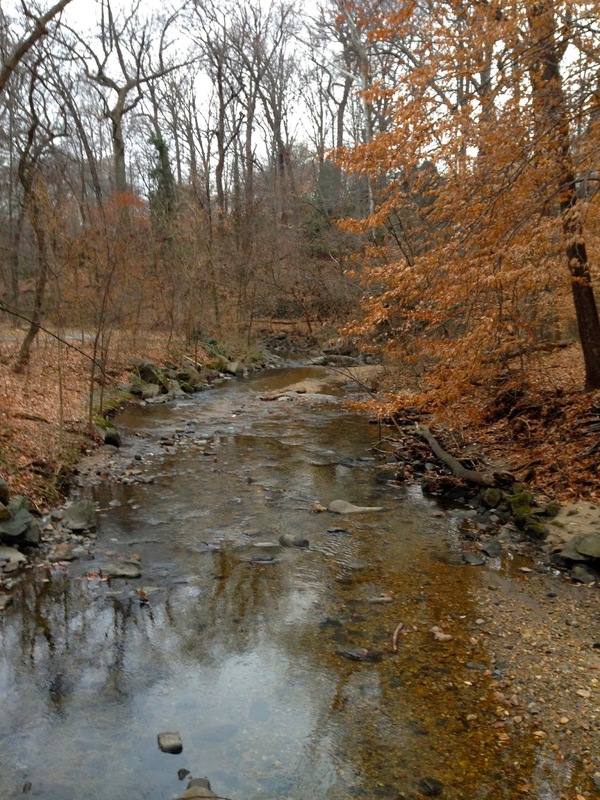 I decided to slip a long walk in before the snow hit, heading down to my neighborhood walking path along Sligo Creek in the early morning. Yesterday, we had weather in the 50s...today we would not leave the 20s. Just before snow, there is a waiting. Just before snow, change is in the air. Just before snow, it is so beautiful outside. the temperature felt, somehow, both cold and warm. There was more moisture in the air, yet the breeze felt dry. The light of the sky seemed to be simultaneously darkening and brightening. I was amazed, alert, aware. 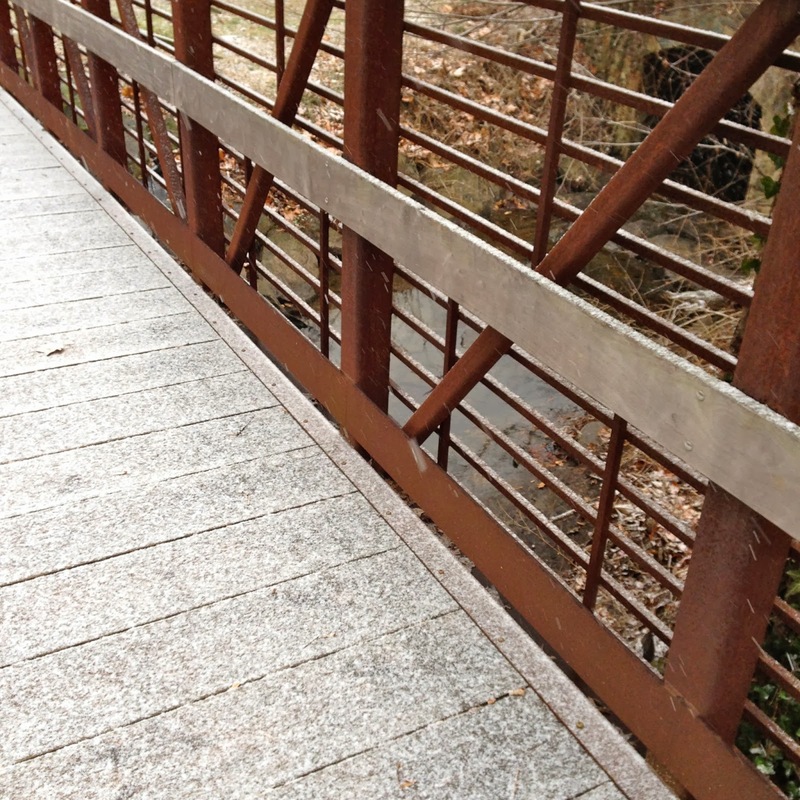 The ground itself was brown with leaves and dirt, only the slightest speckles of snow falling from the sky. It was some time before the snow began to stick to surfaces. For this one hour walk, I was suspended, poised, hovering between two weather extremes. Yes, change was coming. Nature was giving me a full sensory experience of transition. not fully knowing what would be. Just before snow, I could see clearly the work of change. I think the place 'in-between' - as you leave one thing and enter another - is dynamic, restless, filled with invisible movement. What comes next? It strikes me that this is why transitions are so hard for young children. Giving up one thing and moving towards the next. When it is time to do something new, aren't there always a few who run away? or cry? or avoid? Is it the space "in-between"? Is there a not knowing? an unpredictability? thinking it through for each individual child. How will you help the children leave / stop what they are doing? How will the children know? What are your cues? Is there a visual? a special sound? Are there children that need to be forewarned, to be reminded ahead of time? Is there a way to make the transition more joyful? more magical? a song, chant, or dance, perhaps? Is there a way for children to participate in this transition? to feel a sense of control over what is happening? a job or task that they might be responsible for? Where is the pleasure of this new thing they will be doing? flying off again as I got near. when I lost him in the transitioning light. melded with the rock, the whitening path, the dark creek water. Due primarily to the fickle January weather, the Big Cats have been spending a lot longer time in centers and going on shorter walks. It is a great time of year to have longer centers. 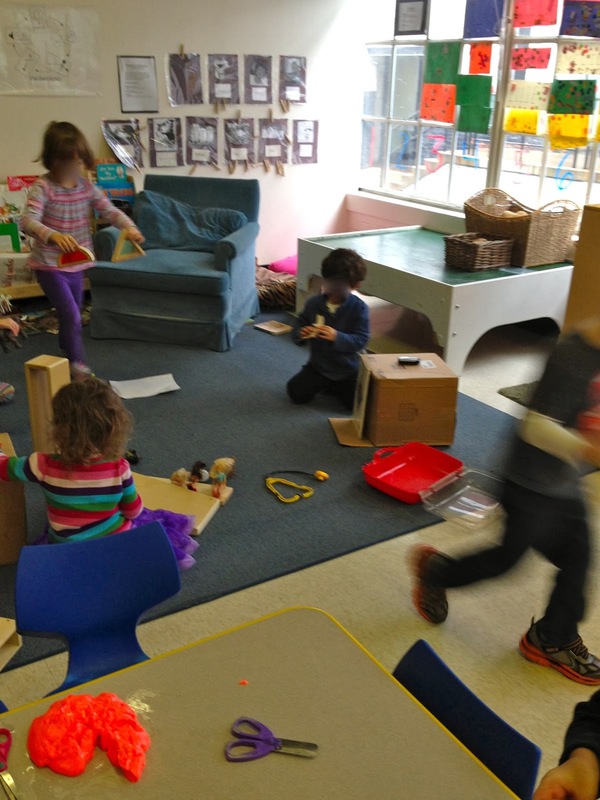 Since winter break, the children are beginning to truly play together, and this emerging cooperative play needs much time, space, and guidance. Centers are just the structure! 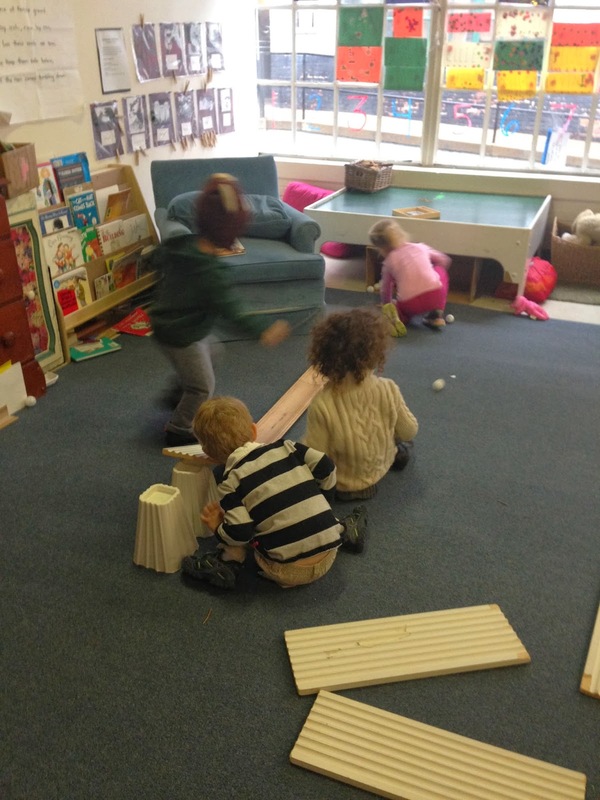 During centers, children work in small groups on a variety of activities, playing alongside one another. Often, the task needs to be done "together" - requiring children to talk, share, and work together. [ ] looks sad - is there a way that she can play, too? Have you asked her if she would like to play? Is that a safe way to use that? Does [ ] have enough materials? Look at how much he has and how much you have - which is more? I see you really want to play with this, but [ ] had it first. Ask her if you can use it when she is through. You bumped into [ ] - have you checked in with him, to see if he is okay? How might you two play this together and have fun? Slow your engine down. You are moving very fast! Did you build that? Remember our classroom rule - you build it, you may knock it down. You should help her rebuild that. Next time, ask if you can knock that block structure down. Tell him you didn't like it when he did that. In board games, we take turns with the dice. Have you finished your turn? Who is next? Hand the dice to [ ]. I saw you cover your ears; was his voice too loud? Tell him that his voice is hurting your ears. You want to play with a toy cell phone, too? Let's ask if [ ] if you can play with one of the two he has. Do you want to use that next? Ooops. [ ] is hurting. Let's go together to get ice. 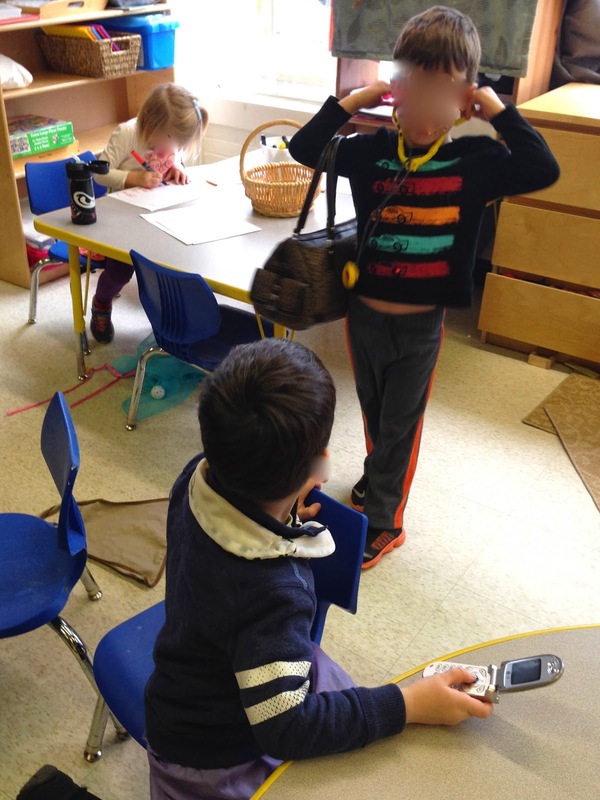 Even the children seem to know that social-emotional learning is the most important work in the room. "What happens when you add salt to the ice?" "[ ] bumps my arm." Today, we had one real sign that it was a rainy day and we were trapped inside - an impromptu game of ball began in the classroom, using a very lightweight, soft, fuzzy ball [we had used this same ball to throw to one another at Gathering, to say good morning to each other]. I'm not sure if the children were playing soccer or basketball...it was a spontaneous, fast-paced, motion-filled game played by Micaela, Evan, Zuren, Alyja, Ada, and Hughie – but only briefly. Jasmine, dressed in an apron and tutu, and playing "family" was surprised and disturbed by this impulsive game and yelled in her most authoritative voice, “Boys! I am angry! Don’t play basketball in the house!” [Of course, the list of players assures you that this was not a boys' game!] Before I could even respond - to either the game or her upset - the ball went soaring through the air and became trapped in the ductwork of our classroom ceiling, some 12 feet above us. Silence came over the room. We now have an on-going inquiry – How to get the ball down? Today’s suggestions: A tow hook (Hughie); a ladder (Zuren); I’ll fly up there and get it (Seymour); a lasso (Shaan). January days, January learning, January fun. Rich and varied moments together. I can't resist writing/sharing about the return to school...preschoolers, after a long winter break - 16 days apart (but who's counting?). After winter break (or any long absence from school), I always plan a "soft landing" - lots of sensory fun, open-ended and exploratory play, and many favorite songs, dances, activities. The more familiar and easy-going the routine, the better the return to school. This new year, the soft landing was particularly needed. On Saturday, I received the news that my Teaching Resident's (Melissa) flight was cancelled due to these horrendous winter storms and she wouldn't be able to return until Wednesday (tomorrow). This, on top of the knowledge that our Teaching Assistant (Claire) had scheduled leave until Thursday of this week. Yes, our three person team would feature only my smiling face on Monday - yesterday - at the children's return. Oh my. Yes, I was a little worried. Thankfully, we were able to have two 'tried and true,' happy, and familiar substitute teachers in place of Melissa and Claire. We would make it work! everything has gone so very, very well. We have had two of the most delightful days of school all year. I forgot about the power of winter break! We need time away from each other - it benefits everyone, whether child or teacher. When it is time to return, everyone is hungry for the routine of school again. It seems as if the children grow so much in this little bit of time. Their faces beamed as they arrived at school yesterday - and everyone had big, big hugs for me. All were quite surprised to not see the other two beloved teachers, but, classmates and favorite activities smoothed away this disappointment, especially with the reassurance of their soon return. How happy the children are to see each other! Their friendships, their enjoyment of one another have "snuck up on me" this year. This is a group of children who are strong individuals, as I've written about in at least one earlier post, and I have accepted this and worked hard to support it in our classroom. But, over winter break, their affection for one another grew and grew - for the past two days, they are not playing alone but in groups of two, three, and four. It is as if they have just discovered one another. How delighted they are to be in our classroom and "be busy." It is their place, their home away from home - they know it and they love it. They have been busy, busy, busy with dramatic play and dress ups (playing 'doctor', 'pizza restaurant,' 'family and babies,' 'keep away from monsters,' and talking on pretend cell phones); building towers, cities, and ramps for balls; playing with puzzles, board games, counting bears; exploring ice, sand, play dough; writing letters and drawing pictures. They are full of discovery and fun. At closing today, Alyja asked - "Can't we play with gak?" and I said, "We don't have any time left today, and, actually, I don't think we have any made. Should we make some tomorrow?" "Yes! In the morning!" she replied and there was an immediate chorus of "Yeah!!" and "Yes" and "We're going to make gak!!" from the others. Melissa and Claire are going to love being back with us!! What if you don't like the change in routine? I learn and re-learn every day. The week before winter break, our school was celebrating "Intersession." For one hour a day - during what is typically centers time or choice time - students work in mixed-age, small groups on a single, fun topic. 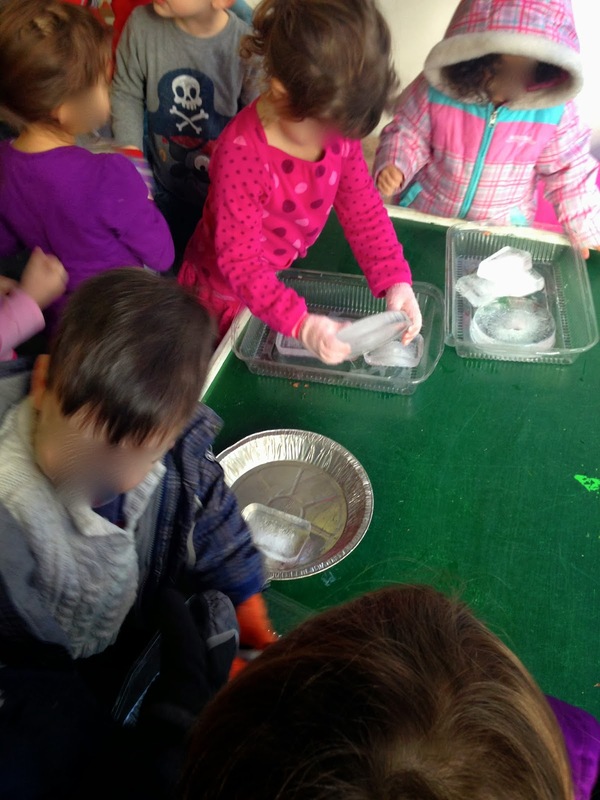 Preschoolers, pre-K, and Kindergarteners participated together in classes such as "Fitness," "Cooking," "Beading," "Yoga." Intersession is a lot of fun, giving both teachers and students a break from their normal routine and an opportunity to explore a topic in a new way. It is a festive, enthusiastic, and invigorating time throughout the school, the perfect change in schedule for the week before winter break. I had the opportunity to be a "floater teacher" during Intersession, which was a really fun change for me. My responsibilities were to visit/check in on the early childhood Intersession classes and ensure that everything was going smoothly. One of my little ones had a tough time with the change in schedule. He cried and stalled and struggled with us, when it was time to line up for Intersession. During his special class - his favorite topic, even - the lead teacher said he was disruptive, hurting others in the class, and trying to run from the room. I have seen some of this same challenging behavior in our classroom. in the midst of the school schedule. He didn't like this, either. Have you had the experience of being around a headstrong three year old who doesn't want to do something? Suffice to say, it was a very long morning of togetherness. I didn't like this, either. refusing to try something new. he is telling me this, loud and clear. He simply didn't have anything left to "give." He needed our routine to be the same, to go back to the way it was, to be normal. It was very "three year old" of him. another disruptive, confusing day for this three year old child. "Well, he's just going to have to get through it." That is not by any means my best teacher voice. a voice that wants to say to a child, "Stop that behavior right now!,"
rather than guiding children to develop self-control. Reflection helped me get past the reactive. I switched places with the assisting teacher in his Intersession class. modeling for him the fun of the new. He was surprised and delighted that I was there with him. "Ms. Ingram came with me!!" We have to meet children where they are. He'll make the leap in time. I am delighted to be at home this cold, grey, wintry Thursday morning, writing and reflecting. With many schools in my area resuming classes today, I feel particularly lucky to be returning next Monday! Today begins my fifth year of writing this blog. Wow. I'm both surprised and amazed at this. I had no idea when I began writing that I would enjoy this medium so very much. I have loved having this outlet - this safe and benign place - for my musings about teaching preschoolers. I am surprised by how much I have written and how much more I want to say, albeit in a random and unpredictable way. I love reading comments from others...and having my thoughts soar in new directions because of these. When I began writing this blog, I imagined that I would "say my piece" and that would be that...probably, I would write only for a brief while. (Honestly, I had no expectations, and I wasn't certain about what "my piece" was!) But, I suspected that there was only so much I could say. The simple act of writing regularly on this topic of preschoolers has made me much more confident and clear about what really matters to me. when in doubt - step back, breathe, and watch.